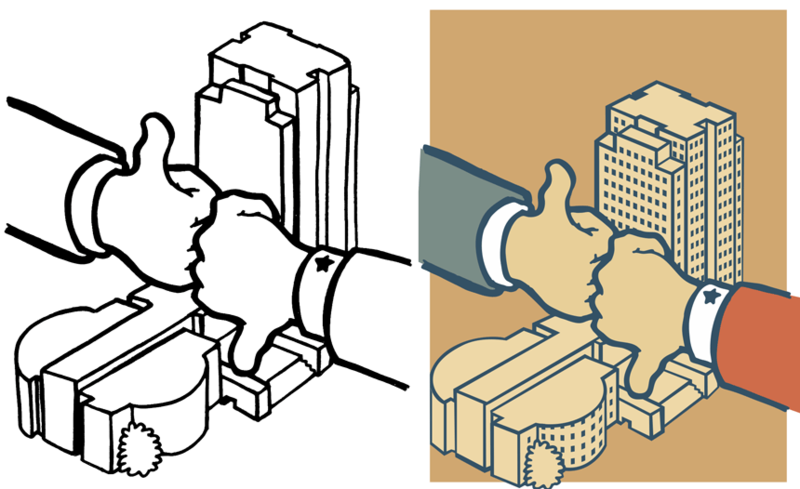 Using the ‘thumbs up/down’ visual over the house and senate portion of the state capitol helped convey the disparity between the two chambers of legislature. 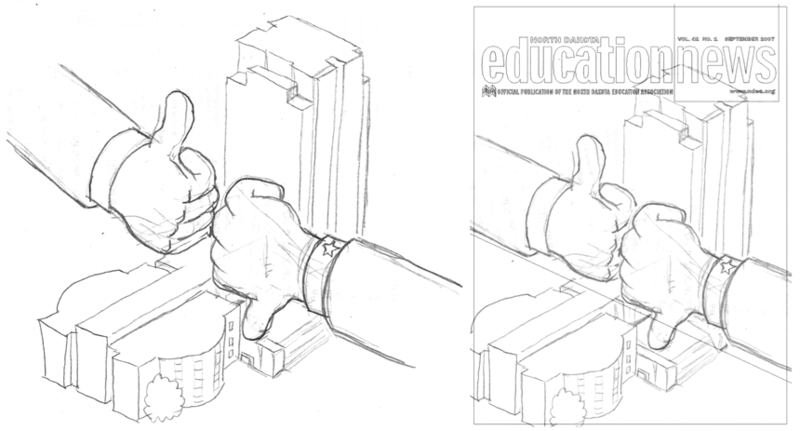 The sketch was dropped into a rough outline of the cover and nameplate to analyze how the proportions and final layout would look. Once final scale and proportion were determined, a basic inking was done of the main elements. This was scanned and converted to vector where color and repetitive elements, like windows, were added. The finished cover was assembled in Photoshop where additional details like texture and halftones were applied. 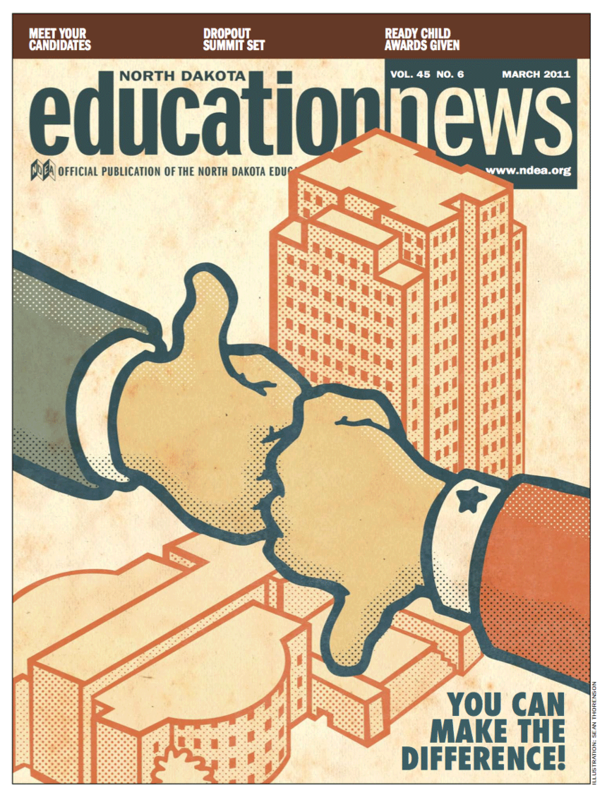 I’ve had a few opportunities to illustrate editorial and feature content for the publication Education News (now United Voices). Like any illustration project, I typically begin with rough sketches based on the content of the story or feature. This particular story dealt with the North Dakota state legislature and how divided the session was shaping up to be on a number of issues. Choosing the symbolism of the familiar ‘thumbs up/down’ visual helped convey the division between the House and Senate. Because this particular illustration was to be used on the cover, I had to factor in how the nameplate would fit into the layout. After a series of working files to determine scale and placement, an inking was done and converted to vector where the areas of flat color were added. The finished cover was executed utilizing texture and halftones in Photoshop.